The original letters and email files can be seen at our showroom on request. In the interest of brevity, this compilation has been considerably abridged. In addition to the comments you see below about how great the furniture looks with replacement covers after 10 years or more, we have received many others that arent shown. Note that, when you see reference to Creative Comfort Co. below, that was our name until 2002. Receiving the Creative Comfort brochure this evening was like getting a letter from an old friend with whom I had lost touch. Five years ago, I purchased a sofa, a glass-top coffee table, and two glass-top end tables from your company. They still look brand new and have been extremely satisfactory in every regard. I especially enjoy their comfort - not too firm, not too soft - and their proportions, which are quite unlike most modern furniture that is designed for people with four-foot-long legs and two-foot-long backs! The only drawback to your furniture is that it is nearly impossible to get visitors to leave..."
. we put the new covers over the original cushion foam which has held up very well." And another note in May of 2011, after purchasing replacement covers for her other three pieces: "Enclosed is a check for all the new cushion covers you made for one of our sofas and 2 chairs. The covers are perfect and look fabulous on our furniture. It is amazing that you still have all the information, measurements and specific details about our furniture to keep making cushions for furniture we purchased from you in 1984 and 1988.... It is also amazing how well you know all your products. I appreciate your e-mailed questions to make sure every measurement for the new cushion covers corresponded exactly to our furnitures measurements. Your attention to detail resulted in a great fit for the covers..... It was also great that even after all these years we could still use the same original foam inserts..... All (of our pieces purchased from you) look and feel as wonderful as when we first bought them. We enjoyed purchasing them many years ago for our Cape Cod style house and continue to enjoy them every day in our newer contemporary style house. We have several close friends who also purchased sofas from you and they too still love their furniture. Thank you." We purchased a entire livingroom set around...1980 ish at the West Concord store here in good old Massachusetts. ..We love the fabric and color of wood we chose. 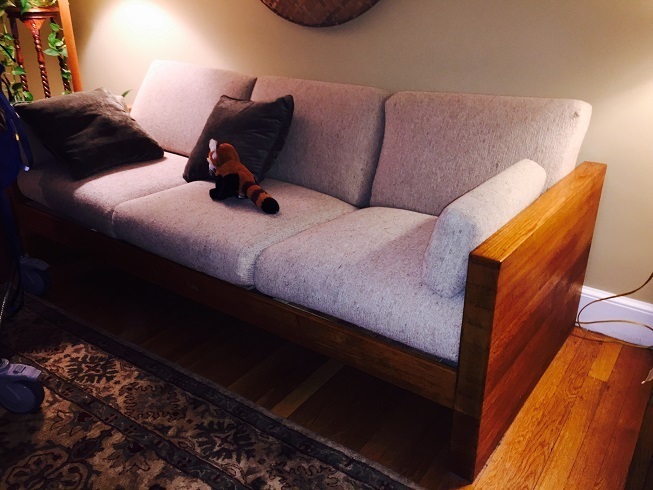 "We are so appreciative of the couch and loveseat we've received from Comfy 1! In the past, we struggled to find durable furniture that could withstand regular use from a young man we support who has a developmental disability. Prior to purchasing your furniture, we wasted time and money by regularly replacing furniture that would not hold up. When we initially decided to take the leap and purchase this set, we weren't sure that anyone could construct durable furniture that could last. Not only have we been pleasantly surprised by how long we've had both pieces, but the fact that they still look good and need so little maintenance is really wonderful. Now that approximately eight years have passed since our original purchase, we continue to be pleased and surprised with the great support and customer service we receive. You've made it so simple to order some replacement pieces (editor's note: a better term would be "replacement components"), the couch once again looks and works like new.Thank you so much for everything you've done, I will certainly recommend Comfy 1 to other care providers." (From the executive director of an organization, Imagine Supported Living Services, in Capitola, California, that cares for the mentally-handicapped, 8/08). Our Massachusetts customer, quoted above, kindly sent us this picture of her sofa with its first set of replacement covers after thirty years. "Here's a picture of the Creative Comfort (that was Comfy 1's name in those days) sofa my parents bought from your Cambridge store in 1974-75... 40 years old and still going strong. My mother Carolyn will never part with it..."
"Two kids, Probably a half dozen dogs, six houses (Ohio, NY, Mass x 4) and just one set of replacement covers." As you can see, our designs have changed somewhat since those days -- the "butcher block" look was in vogue at that time, and solid oak was more affordable to use in large quantities. But the durability and long-term economy of our furniture and the customer satisfaction haven't changed. To go to the page explaining why it's worth paying more for our furniture than for ordinary furniture click here.